Taking a dive in the Giveaway Pool this Friday! Giveaway Pool Fridayswill feature an amazing review or giveaway and provide you with a way to share some linky love your way by promoting your own giveaways on Blessings Abound! Please leave your links in this format: Blog name (prize information- ending date) and link to the actual giveaway and not your homepage. In 1924, two Belgian industrialists, Armand Desaegher (a casting specialist) and Octave Aubecq (an enameling specialist), met at the Brussels Fair. They decided to create a foundry which would enamel various cookware items. In 1925, Le Creuset was born and setup business in Fresnoy le Grand in Northern France, approximately 120 miles northeast of Paris, set among rolling hills and arable landscapes. This move was a strategic one for the company, putting it at the crossroads of transportation routes for the raw materials of coke, iron, and sand. The same year, the first Cocotte (French Oven) was produced. This shape and indeed the name was the pivot of what is now an extensive range of cookware. From 1935 to 1945, Le Creuset began to develop its product ranges: cookers, charcoal stoves, hot plates for electric cookers, and kitchen utensils… as well as a commercial strategy. A first publicity campaign on the radio and in the press was launched to promote the quality of enameled cast iron cookware. However, the onset of war brought troubled times, and the foundry was used by the Wehrmacht to make grenades. A new start was seen from 1945 to 1955. After the 2nd World War, contrary to its competitors, Le Creuset concentrated on its range of enameled cast iron cookware and was a major innovator of the time with new and exciting styles and pieces. Originality was shown in the creation of various enamel colors. In 1952, export to other countries really began, 50% was destined for Europe and 50% for the United States. In 1974, Le Creuset took a further leap into the USA and setup a subsidiary, Le Creuset of America, Inc., in the South Carolina Lowcountry. Over the years, numerous innovations have been seen in product designs and colors. Today, Le Creuset is now sold in more than 60 countries around the world including the US, UK, Japan and Australia. Through the Mom Trials: It seems as if your cookware line isn’t complete without at least one good nonstick fry pan! I recently had the opportunity to try out Le Creuset’s new line of Forged Hard-Anodized Cookwareand let me tell you, this 12 inch fry pan is beyond good, it’s incredible! Cooking sticky foods that normally get gunked onto pans is a dream in this pan! 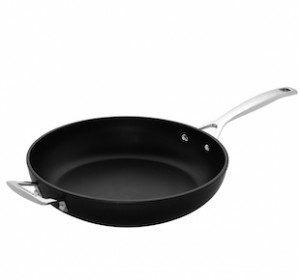 It evenly cooks and browns food perfectly and is ideal for one pan meals, deep frying, sauteing, and pan-frying. Cooking up omelets is made effortless in the Le Creuset Deep Fry Pan! The omelet doesn’t stick to the pan and cleaning up is a snap! Deep frying and sauteing couldn’t be better with the deep side walls and slightly narrower cooking surface and helps to keep the hot oil from escaping the deep fry pan. The large cooking space makes it convenient for one pan meals, leaving less pans to clean after cooking is done. The glass lid fits the pan nicely ensuring even cooking and keeps food warm until it’s mealtime! These pans are sturdy and well made and will surely last a lifetime. You can use metal utensils with this cookware and it won’t hurt the fry pan one bit! You can also stick these pans in an oven safely up to 500°F and their glass lids are oven safe to 325°F. Regular nonstick pans can’t even match the performance of this amazing pan! I have never been so impressed by a pan that is so versatile and quality crafted and if I had to choose only one pan to cook all my meals in, this would be the one and the deep fry pan and glass lid set is well worth the $170 price tag! 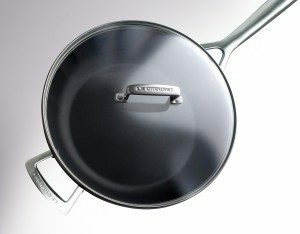 Giveaway Time: A lucky Blessings Abound Mommy reader will win a Le Creuset 12 inch deep Fry Pan with Glass lidfrom their new Forged Hard-Anodized Cookware Line (arv $170)! All you have to do in order to be qualified to win is to visit Le Creuset and pick out another piece of you’d Le Creuset Cookware love to own! Winner will be chosen via Random Drawing. Winners who I am unable to contact and who doesn’t claim their prize within 48 hours of being sent their winning email notification and me posting the winner of the prize in the winner’s section will forfeit their prize and prize will be held in a live contest following failure to claim. Please follow directions or you will be disqualified! This Blessing is open to bloggers and nonbloggers alike. You have from now until October 2nd at 11:59 PM (Alaska time) to comment and be entered for a chance to win. I will randomly a winner and announce it here on my blog shortly after October 3rd! Blessing open to USA! *This review is based solely on my personal opinion and experience only and results may vary person to person. We’re floating in the Giveaway Pool this friday! Giveaway Pool Fridayswill feature an amazing review or giveaway and provide you with a way to share some linky love your way by promoting your own giveaways on Blessings Abound! Please leave your links in this format: Blog name (prize information- ending date) and link to the actual giveaway and not your homepage. The last time the sisters of Lime Ricki sat around what-if’ing at a family get-together they found themselves eight months later pushing each other to the finish of the Top of Utah Marathon. This time it all started after Colette’s frustrating trip to the mall, searching for a swimsuit for her teenage daughter. She wasn’t willing to blow 80 bucks on some designer dental floss, but it was either that or a floral print spandex burqa. What was she to do? She took the issue to her sisters. What ifthey designed their own swimsuits? Tankinis that were trendy—not spendy—in designs that their friends and their daughters would actually wear? Lime Ricki Swimwear is all about exposing your style while keeping you comfortably covered. (That means no tugging, pulling, adjusting or otherwise worrying about anything hanging out.) The sisters of Lime Ricki have designed these suits for YOU! They are high quality swimwear made for swimming, lounging, playing, and most importantly, looking hip. Through the Mom Trials: With summer quickly approaching, it’s time we put our attention to the upcoming swimsuit season. As moms, we can safely say our figure is not quite the same as before we had our precious children and many of us aren’t comfortable sporting a bikini in our postpartum form and we’re definitely not thrilled to put on a swimsuit that isn’t flattering and unfashionable. That’s where Lime Ricki’s modest swimsuits combined with a modern twist comes into play! You don’t have to look drab to be appropriately covered and Lime Ricki’s swimsuits come in a wide range of flirty, fun prints that protects your body from unwanted skin peeking out. They also include a Key Lime swimsuit line where they carry sophisticated swimsuit styles that have the added benefits of slimming and trimming you figure while adding top coverage and offer a Gabby Tankini Top that’s cute and benefits the Susan G. Komen Foundation to help fight breast cancer! I received the Amelia Tankini Top and Turquoise Bottoms and I just adore it! I love the extra length of the tankini because it doesn’t ride up and expose my midriff during swimming and intense physical activity. The fit is very flattering as the polka dot print sets off a look that minimizes your middle area. I like that I no longer have to feel self concious that the tankini will creep up and show my untoned tummy and still enjoy the freedom of a two piece. The vintage inspired look with polka dots, rouching, and ruffles are simply adorable and girly, much better than wearing some of those plain jane, slimming swimwear. It’s a darling swimsuit that keeps me adequately covered and has an added sweet touch by providing extra straps that tie in the back. The bottoms are comfortable to wear and are made with a 2″ band on the top for more coverage. Another great thing about their swimsuit collection is that you can mix and match bottoms with the tops to create different styles of swimsuits to fit your personality! Giveaway Time: A lucky Blessings Abound reader will win a swimsuit of your choice from Lime Ricki! All you have to do in order to be qualified for a chance to win is to browse through their hip line swimsuits and leave a comment with which swimsuit you’d like to win! Winners who I am unable to contact and who doesn’t claim their prize within 72 hours of me posting the winner of the prize will forfeit their prize and I will redraw a new winner. Please follow directions or you will be disqualified! This Blessing is open to bloggers and nonbloggers alike. You have from now until May 11th at 11:59 PM (Alaska time) to comment and be entered for a chance to win. I will randomly pick a winner and announce it here on my blog shortly after May 12th! Blessing open to the USA and Canada! We’re riding the waves this Friday! Giveaway Pool Fridays will feature an amazing review or giveaway and provide you with a way to share some linky love your way by promoting your own giveaways on Blessings Abound! Please leave your links in this format: Blog name (prize information- ending date) and link to the actual giveaway and not your homepage. “Creativity has been in my blood since the day I entered the world. I would say it’s genetic but I was also influenced and inspired by my family…mostly by my amazing mom who was my elementary and middle school art teacher and by my younger sister who made all kinds of arts and crafts projects with me so we could sell our goods to kind people in our front yard. I was also influenced by my upbringing…by growing up in Venezuela, Mexico and Puerto Rico; I was always surrounded by vibrant colors, shapes and textures. By the time I was in high school, it was inevitable that I was assigned to projects like creating yearbook covers and musical play posters and that I was focused on a career in graphic design. However, my practical side took over when Carnegie Mellon University in Pittsburgh, Pennsylvania recruited me to join their management program in the publishing and printing industries. So I left San Juan and via the college route, I landed in a sales and marketing job in the hustling and bustling business climate of the Northeast. Although I managed to dabble in creative hobbies, I became fully immersed in my corporate career as a direct marketing professional in Philadelphia (although I never got used to the winter). As time went on, I got married and had 2 exceptional kids and while my personal life was amazing, I got really-really bored with work. As much as I continued to learn so much about business and it continued to result in successful jobs and great experiences, I knew I missed my calling. So I started taking a hodge-podge of art classes at a local college…and thrived. I had fun in drawing, totally dug my color theory teacher, got frustrated with classical painting, poked around graphic design programs and absolutely fell in love with metal smithing. Once I was exposed to the craft, I trained for over 4 years learning all kinds of jewelry making techniques and was completely captivated once I started creating dimensional and colorful pieces by fusing glass and clay. I became obsessed with this material and how to use it to make wearable and edgy art. Right about the same time, my sister turned the big 4-0, so she picked out her special birthday gift…this very cool glass necklace I made with scrap glass in one of my classes. And as she wore it, she said it literally enhanced her mood. People would stop her in all kinds of weird places and kept asking her where they could buy a necklace just like hers and the rest, as they say, is history. 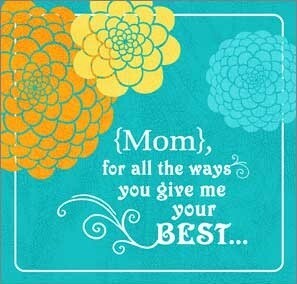 Mother’s Day is quickly approaching and I know many of you are pondering what to give your dear mother this year. Have I got a hip find for your mom! I received a chic and personalized toggle necklace from Hip Fusion Designs that puts the ordinary hand stamped necklace to shame! It is a handcrafted necklace with sterling silver beads and features bar tags that are anchored on a clasp that you take off and fasten from the front instead of the back creating a fresh, unique look that’s easy to wear. You can add up to 6 tags and customize the front and back with whatever you’d like on them and you also have the option between several different types of beads to be strung on the necklace to fit your preference. I personalized mine with my children’s name on it and I love wearing this beautiful piece of jewelry that speaks volumes of my love for my little blessings! All Neida’s creations are stunning pieces of art that is durable and made to last and even includes a lifetime guarantee! Along with providing personalized and made to order items. she offers many ready to go designs that she keeps on hand and are available to ship right away. Neida is pleasant to work with and provides terrific customer service and takes her time to ensure that your purchase will arrive the way you have specified. Last but not least, her items are shipped at a flat rate of ony $7 and comes packaged in a beautiful gift box and lovely ribbon made out of recycled and Eco-friendly materials that takes the headache out of gift giving! Any of the gorgeous pieces of jewelry found in this collection would be a terrific gift for any occasion and a personalized necklace would be a heartwarming gift that any mom will cherish! Giveaway Time: A lucky Blessings Abound reader will win a $100 Gift Certificate to Hip Fusion Designs! All you have to do in order to be qualified for a chance to win is to sign up for their newsletter here! Want to earn extra entries??? Fave my blog on Technorati. Winners who I am unable to contact and who doesn’t claim their prize within 72 hours of me posting the winner of the prize will forfeit their prize and I will redraw a new winner. Please follow directions or you will be disqualified! This Blessing is open to bloggers and nonbloggers alike. You have from now until April 24th at 11:59 PM (Alaska time) to comment and be entered for a chance to win. I will randomly pick a winner and announce it here on my blog shortly after April 25th! Blessing open to the USA and Canada only! Chloe bracelet was made for my daughter. Sterling block letters are accented with fuschia Swarovski crystal rounds. The sides are made with silver ribbed noodle tube beads, Swarovski crystal bicones and silver beads. Finished with a heart toggle clasp. Just let us know the name and color you would like! Michabella Creations is the concept of two friends who share a love for beading & handcrafting jewelry. Each of us brings our own unique perspective to the designs, which makes them one-of-a- kind. Our goal is to bring you handcrafted jewelry that is made with only genuine Swarovski crystals, freshwater pearls, silver, semi-precious gemstones, brass, and beautiful glass beads, while staying at an affordable price. We know the importance of high-quality without the high price tags! As a stay-at-home mom, Michelle found that making jewelry gave her a way to express her creativity. Cindy, who works a full-time job as well, started out making cancer bracelets for the Relay for Life. We began showing our designs to family and friends, and from there, started receiving orders. Now it has grown into a business for us! We are excited to be sharing our handcrafted creations with everyone. We hope you love our designs as much as we do! Remember that anything you see can be customized according to your preference! We believe in giving back as much as we can. We are very involved with our community. By selling our cancer awareness items, we have been able to donate to charities such as the PA Breast Cancer Coalition, the American Cancer Society, Children’s Miracle Network, and the SPCA. You can feel good by knowing that your purchase of any of our cancer awareness items will have a percentage donated to a worthy cause! Giveaway Time: A lucky Blessings Abound reader will win a lovely Bloomin’ Earring Set that you can interchange the blossoms to four different flower sets on brass arched earwire so you’ll have a pair on hand to compliment just about any outfit in your closet! 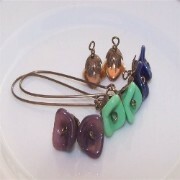 This set includes blossoms in colors seafoam green, topaz, navy blue, and amethyst purple. All you have to do in order to be qualified to win is to visit Michabella Creations and leave a comment with another piece of jewelry (not mentioned in this post) that strikes your fancy! 10 Extra Entries: Blog about this giveaway, including links to this post, Michabella Creations, and MomDot’s Party Post. Daily Entry: Visit MomDot every day of May and enter the birthday contest for that day, leave a comment here for each of the 30 other birthday giveaways you enter, letting me know which one you entered. Please leave a separate comment for each item that you have completed stating that you have done so.Winners who I am unable to contact and who doesn’t claim their prize within 72 hours of me posting the winner of the prize will forfeit their prize and I will redraw a new winner. Please follow directions or you will be disqualified! This Blessing is open to bloggers and nonbloggers alike. You have from now until May 31st at 11:59 PM (Alaska time) to comment and be entered for a chance to win. I will randomly pick a winner and announce it here on my blog shortly after June 1st! Blessing open to the USA! Reusable Bags Earth Day Review and Giveaway! After years of development, ReusableBags.com launched in August 2003, quickly establishing itself as the the preeminent website dedicated to the promotion & use of reusable shopping bags as a pragmatic solution to the growing problems caused by the massive/mindless over-consumption of single-use plastic (& paper) shopping bags. Acting as a hub, reusablebags.com spreads awareness by educating consumers with facts on consumption/litter, and provides summaries of news articles and trends from around the world on the global push to reduce plastic bag consumption. Its store offers a wide range of high-quality, stylish, durable reusable shopping bags and accessories designed to help consumers reduce and reuse. Through the Mom Trials: We all know that using reusable bags is one easy step we can all take to take care of our Earth and Reusable Bags makes it simple by providing a wide variety of reusable bags including some of my favorites such as Envirosax, Built NY, and Acme. With their extensive collection of reusable bags, it provides a one stop shop for all your reusable bag needs from shopping bags, lunch bags, produce bags, and more making it convenient for you to find reusable bags that fit your particular lifestyle. In addition to providing reusable bags, they also offer reusable water bottles like Sigg, Kleen Kanteen and Earth Lust to help reduce the waste of disposable beverage containers. Why not celebrate Earth Day the right way and commit to using reusable bags and water bottles in your life today! I have the Reisenthel Flora Market Bag and this is one of the most beautiful reusable bags out there! Any hip mom would look stylish carrying one of these gorgeous market bags to the store. I just adore the vibrant floral pattern on the bag and the design is impeccable. This bag features durable, lightweight aluminum frame, tear-proof polyester cover, sturdy bottom with rubber feet, soft rubber-grip handle, and an interior zip pocket. It’s very easy to take along with you as it collapses down when not in use and the inserts are a breeze to put in when needed. 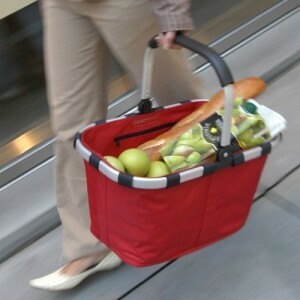 It’s a terrific size for just about any errand you need to run and makes a perfect picnic or garden basket. I’ve used this market bag many times for hauling things to and from my car and it’s remained in tip top condition with plenty of life left in it. It’s amazing to see how much this bag holds and that it stands up to the weight when I’ve packed it full to the brim. I also like the fact it’s made out of recyclable materials and looks chic while saving our environment from plastic bags one bag at a time! 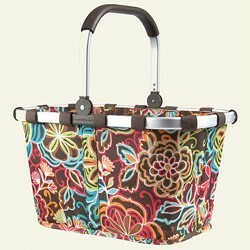 Giveaway Time: A lucky Blessings Abound reader will win this pretty Reisenthel Flora Market Basket! All you have to do in order to be qualified to win is to visit Reusable Bags and leave a comment with another reusable bag that you would find useful in your daily life! 5 Extra Entries: Blog about this Blessing with a link back to the giveaway. Winners who I am unable to contact and who doesn’t claim their prize within 72 hours of me posting the winner of the prize will forfeit their prize and I will redraw a new winner. Please follow directions or you will be disqualified! This Blessing is open to bloggers and nonbloggers alike. You have from now until May 2nd at 11:59 PM (Alaska time) to comment and be entered for a chance to win. I will randomly pick a winner and announce it here on my blog shortly after May 3rd! Blessing open to the USA and Canada! Send Your Mom All Your Love with Hallmark Giveaway! Hallmark has terrific Mother’s Day cards to knock your Mom’s socks off this year! These outstanding greeting cards are much like the Hallmark cards I shared with you around Valentine’s Day where they feature a ten second recording so you can give them the gift of your voice plus music that follows that fits the theme of the card. What a special way to make this day stand out and add the personal meaning that only you can put into the card. My children and I enjoy giving these cards out to our loved ones and know you will have fun customizing these cards to say what’s truly in your heart. You’ll find these recordable cards with music in their Father’s Day Cards collection too so you can pick a card for each occasion and you’ll want to remember these dates so you can be sure to get your Hallmark cards in time: Mother’s Day is May 10th and Father’s Day is June 21st. 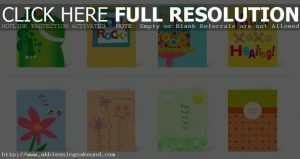 Hallmark has also introduced some new types of cards in their affordable 99-cent collection. They’ve added cards to fit just about any event or circumstance for a sweet deal so that you can be prepared for any holiday or special occasion that comes your way, especially those that come around last minute. I know one of the best ways to make someone feel good is to cheer them up with a card letting them know that you’ve been thinking of them and at this awesome price, you can stock up so you’ll never be caught without the right card to express exactly how you feel! I get so wrapped up in my daily life sometimes those events just sneak up on me and I’m caught last minute, scrambling to the store for a perfect card. Hallmark has come to my rescue to provide these cards that anyone can afford to keep a stash of them so you’ll have the card you need no matter how much notice you have. You can also pick out a card online, customize it the way you want, and Hallmark will ship it on your behalf for the price of the greeting card and stamp! That’s a convenient and budget friendly way to send your greetings when you don’t have a Hallmark location nearby. My local Hallmark is a good hour’s drive away and I’m not always able to get out there so this online process makes it easier and simpler to get the card I need in the comfort of my own home. You’ll save time and money since you won’t have to get in your vehicle and use an ounce of gas or round up your family for a trip to town. This technology makes it so anyone can send out cards no matter how busy your schedule is! Giveaway Time: Three lucky Blessings Abound readers will win a Hallmark Cards Prize Package that includes two recordable Mother’s Day Cards, two recordable Father’s Day Cards, and four 99-cent every day cards! All you have to do in order to be eligible for a chance to win is to leave me a comment with what special plans you have for your Mother for Mother’s Day this year! Tell Her Story At Things Remembered Mother’s Day Giveaway! Things Remembered began over 40 years ago as a small engraving and services shop called “Can Do”. And today, Things Remembered has grown into the nation’s leading, and most successful, retailer of personalized gifts. We’re proud of our longevity in the retail business and we are committed to continue to offer beautiful, unique, quality, personalized gifts to our customers. Today’s Things Remembered customers can browse through our collection of gifts that goes far beyond expectations. Plus, we’ll engrave gifts purchased elsewhere! No matter what the gift or where you purchased it, we can engrave the item for that extra, personal touch. Simply bring your item to any of our 600 nationwide mall locations and one of our experts will carefully engrave it. Things Remembered offers three ways to shop. Whether you’re shopping online or in one of our 600 stores across the country, Things Remembered customers receive excellent personal attention and service from over 5,000 of the friendliest, most accommodating teammates in the retail world. And customers can place orders directly through our Customer Service call center in North Jackson, Ohio and they’ll be treated to equally attentive service. About Charm Story: This new line of silver plated charms gives you the ability to create your own “story” by capturing your life’s best moments through a series of personalized charms. Their collection of charms reflect special events in your life that when put together in a bracelet or necklace displays your one of a kind life story. There are several charm categories that match heartfelt occasions or milestones in your life such as photo charms, birthstone charms, and first chapter charms. What’s so neat about them is that you can engrave each charm with names, dates, and personalized messages and I can’t wait to show you my story in an upcoming review! 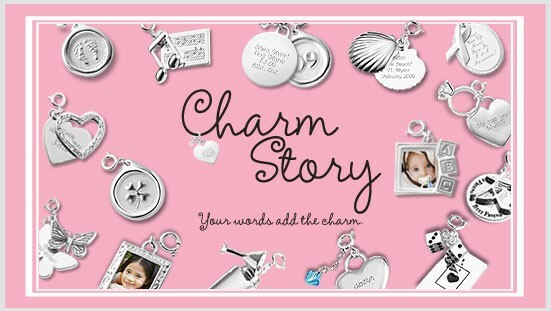 These charm stories would make a wonderful, personable Mother’s Day Gift! Giveaway Time: A lucky Blessings Abound reader will win your choice of bracelet or necklace that includes your choice of charm and engraving! All you have to do in order to be qualified to win is to check out Thing’s Remembered Charm Story line and leave a comment on which silver charm you’d choose and what you’d engrave on it! 5 Extra Entries: Follow Things Remembered on Twitter at www.twitter.com/tremembered and dm this message to tremembered: I am following you because of Blessings Abound’s Things Remembered Charm Story Giveaway post! Blog about this Blessing with a link back to this giveaway post. Winners who I am unable to contact and who doesn’t claim their prize within 72 hours of me posting the winner of the prize will forfeit their prize and I will redraw a new winner. Please follow directions or you will be disqualified! This Blessing is open to bloggers and nonbloggers alike. You have from now until 95th at 11:59 PM (Alaska time) to comment and be entered for a chance to win. I will randomly pick a winner and announce it here on my blog shortly after May 10th! Blessing open to the USA! Yoplait Frozen Smoothie And KitchenAid Blender Review And Giveaway! Yoplait® Frozen Smoothies are a quick and easy solution to help you get those important nutrients, plus a whole lot more, and now they’re available in a new, delicious Blueberry Pomegranate flavor! Each package of Yoplait Frozen Smoothies contains one full serving of fruit (1/2 cup) and only 110 to 120 calories per serving. In addition to containing live and active cultures provided by Yoplait® yogurt, when prepared with skim milk and made according to package directions, Yoplait Frozen Smoothies are also a good source of calcium. There’s one treat we have daily in our family and that is smoothies! I’ve found it to be the easiest way to sneak veggies and help ensure that my kids are getting their full servings of fruit and veggies every day. In fact, my husband has them in place of ice cream as a healthy alternative and as a way to help watch his weight and curb his appetite for junk food. Yoplait has come up with a simpler and faster way to make your own smoothies at home. Yoplait Smoothiehas fruit and yoplait yogurt chips premixed in each bag so all you have to do is add milk and you’ve got two servings of tasty smoothies made! These are also the very same smoothie mixes you’ve seen on the famous show, The Big Loser which airs on Tuesdays at 8/7c on NBC. Our family tried the Triple Berry and Strawberry Mango Pineapple flavors. They were both delicious, but being a lover of all things berry, the Triple Berry was a hands down favorite. We tried them with both regular milk and almond milk and each concoction was just as tasty as the other. The ratio of fruit, yogurt, and milk is right on providing a good blend of a fruity goodness and provides a balanced slushy consistency that can be made in no time at all! We’re looking forward to trying the rest of the flavors like the new Blueberry Pomegranate. Deal Alert: Visit the online link above to receive a printable coupon for $1.25 off any one flavor of Yoplait Frozen Smoothie. Giveaway Time (required entry): A lucky Blessings Abound Mommy reader will win a prize package that includes two VIP coupons to try Yoplait Frozen Smoothies and a 3-speed KitchenAid® blender with a special smoothie setting. All you have to do in order to be qualified for a chance to win is to leave a comment with your favorite time of day to enjoy Yoplait Frozen Smoothies! Like the Yoplait Smoothie Facebook Page. Write on the Yoplait Smoothie Facebook Wallthat you entered to win coupons for Yoplait Smoothie and a Kitchen Aid Blender on Blessings Abound Mommy with a link back to this post. Twitter about this blessing with a link back to it and leave a comment that you did with your twitter id. Follow Yoplait Smoothie on Twitter @YoplaitSmoothie. One winner will be chosen via Random Drawing. Winners who I am unable to contact and who doesn’t claim their prize within 48 hours of being sent their winning email notification and me posting the winner of the prize in the winner’s section will forfeit their prize and prize will be held in a live contest following failure to claim. Please follow directions or you will be disqualified! This Blessing is open to bloggers and nonbloggers alike. You have from now until November 30th at 11:59 PM (Alaska time) to comment and be entered for a chance to win. I will randomly pick one winner and announce it here on my blog shortly after December 1st! Blessing open to USA only! *Product and information was provided free of charge in exchange for this post from MyBlogSpark and KitchenAid and doesn’t affect my views or feedback of the product or service. This post is based solely on my personal opinion and experience and results may vary person to person. Volkswagen Routan Summer Road Trip Survival Pack Giveaway! I just love Summer road trips with the family! After being cooped up all winter long with almost 24 hours of darkness, getting out in the sunshine is just what our family needs and what better way to enjoy the sun, fresh air, and Alaska’s beauty than going on a scenic road trip? My favorite road trip of all time was when my dad and mom took our family and relocated to Alaska from Texas when I was twelve years old. I had never been on such a long journey in my life, but I was able to see so many sights along the way and experience how different parts of the country are unique and the different cultures that shaped each city and state that we drove through. I’d love to go across country again, this time with my husband and children, and see the countryside together! Summer is just around the corner which means time to round up the kids and head out on a family vacation road trip! Whether going across country to a national park or just taking the kids up to the grandparent’s house, half the fun is getting there. And it doesn’t matter where you’re headed; you’re going to want to be comfortable along the way. With 12v power outlets, JoyBox™ Entertainment system, UConnect® Bluetooth® system, roof rack and more, the Volkswagen Routan provides comfort and fun for the family. To celebrate Volkswagen’s Routan making vacation easier, they are offering my readers a VW Routan Summer Road Trip survival pack! Giveaway Time (required entry): A lucky Blessings Abound Mommy will win a VW Routan Summer Road Trip Survival Pack that includes 2 No-spill cups for babies/toddlers, Travel editions of board games (Travel Candyland® game and Travel Guess Who® game), Coloring book w/ color-changeable markers, 1 VW Electric Guitar (not pictured), 2 DVDs of the latest family movies (to be selected by Sponsor) to play in the Routan minivan’s JoyBox™ Entertainment System, 1 Bluetooth headset to use with the Routan minivan’s UConnect® Bluetooth® system, 1 Battery Jumper, 1 Fix-A-Flat Tire inflator, 1 AAA® Emergency Preparedness Kit, and 1 neck pillow (not pictured). All you have to do in order to be qualified for a chance to win is to leave a comment with your favorite road trip memory! One winner will be chosen via Random Drawing and another winner will be chosen by best story submitted. Winners who I am unable to contact and who doesn’t claim their prize within 48 hours of being sent their winning email notification and me posting the winner of the prize in the winner’s section will forfeit their prize and prize will be held in a live contest following failure to claim. Please follow directions or you will be disqualified! This Blessing is open to bloggers and nonbloggers alike. You have from now until June 23rd at 11:59 PM (Alaska time) to comment and be entered for a chance to win. I will randomly pick one winner and announce it here on my blog shortly after June 24th! Blessing open to USA only! The approximate retail value of the Grand Prize is $400. Prize(s) consist(s) only of items specifically listed as part of the prize. Prizes are nontransferable and no substitution or cash equivalent is allowed, except in Sponsor’s sole discretion. Sponsor reserves the right to substitute prize of the same approximate retail value. All taxes, costs and expenses not specified herein related to the prize(s) are the sole responsibility of the Winner. If the prize is a gift card, any terms and conditions of the gift card shall apply. HOW TO ENTER: To enter the Sweepstakes (the “Sweepstakes”), go to BLOG URL, and follow the instructions shown. The Sweepstakes begins at TIME AND DATE and ends at TIME AND DATE (“Promotional Period”). ELIGIBILITY:Sweepstakes is open only to U.S. residents 18 years of age or older at the time of entry. Void where prohibited by law. Sponsor and employees Volkswagen, and their respective affiliates, as well as all others involved in this promotion and their immediate families (defined for the purposes of this Sweepstakes as parents, spouses, children, siblings and household members) are not eligible. Sweepstakes is subject to all federal, state, and local laws and regulations. PRIZE DRAWING:NUMBER Prize(s), as described below in the Prize and Approximate Retail Values section, will be awarded in a drawing done at the conclusion of the Sweepstakes on or about [DATE OF DRAWING] to one (1) winner, selected at random by the blogger from among all eligible entries received throughout the Promotional Period. The odds of winning depend on the number of eligible entries received throughout the entire Sweepstakes. WINNERS: Prize(s) will be awarded in a random drawing by the blogger, whose decisions on all matters relating to the Sweepstakes will be binding and final.Winner will be notified on or about two (2) days following winner selection. Winners will be chosen randomly and notified by email. Winners must respond within 48 hours or another winner will be chosen by the blogger. A list of winner(s) can be obtained by writing to maureen@m80im.com Winners should allow 6 to 8 weeks to receive shipment of their prizes. ADDITIONAL TERMS: This Sweepstakes is valid in the United States only. If you do not live in the United States, do not enter the Sweepstakes. If for any reason the Sweepstakes including, but not limited to, the online portion, does not function as planned, its integrity or feasibility is undermined, or anything compromises the administration, security, fairness, proper conduct or intended play of the Sweepstakes, Sponsor reserves the right at its sole discretion to disqualify any individual the Sponsor deems responsible, and/or to abbreviate, cancel, terminate, modify, or suspend the Sweepstakes. Sponsor assumes no responsibility for any defect or delay in operation or transmission, communications failure, theft, destruction or unauthorized access to, or alteration of, entries, including any erroneous appearance of qualification for a prize. If the Sponsor, in its discretion, elects to abbreviate the Sweepstakes, the Sponsor reserves the right, but shall have no obligation, to award the prize(s) from among all valid and eligible entries received up to that time. All entries are the property of the Sponsor and are not returnable. WARNING: ANY ATTEMPT BY ANY PERSON TO DELIBERATELY DAMAGE ANY WEB SITE OR UNDERMINE THE LEGITIMATE OPERATION OF THIS SWEEPSTAKES IS A VIOLATION OF CRIMINAL AND CIVIL LAWS AND SHOULD SUCH ATTEMPT BE MADE, SPONSOR RESERVES THE RIGHT TO SEEK DAMAGES FROM ANY SUCH PERSON TO THE FULLEST EXTENT PERMITTED BY LAW. Sweepstakes entries generated by a script, macro, or other automated means are ineligible and will be disqualified. RELEASE OF LIABILITY:By entering, entrant agrees to accept and abide by the rules of this Sweepstakes and agrees that any dispute with regard to the conduct of this Sweepstakes, rule interpretation, or award of prize, shall be resolved by Sponsor in its sole discretion, whose decision shall be binding and final. By participating, entrant agrees to release and hold harmless the Sponsor and any respective parent companies, affiliates, subsidiaries, and the officers, directors, employees, agents and representatives of each from any injury, loss or damage to person or property due in-whole or in-part, directly or indirectly to the acceptance, use, or misuse of a prize, participation in any Sweepstakes-related activity, or participation in the Sweepstakes. Sponsor is not responsible for any typographical or other error in the printing of this offer, administration of the Sweepstakes or in the announcement of prizes, including such error as may give an erroneous indication that a prize has been won. *Product was provided free of charge in exchange for giveaway fromVolkswagen and M80 and doesn’t affect my views or feedback of the product or service. This post is based solely on my personal opinion and experience and results may vary person to person.